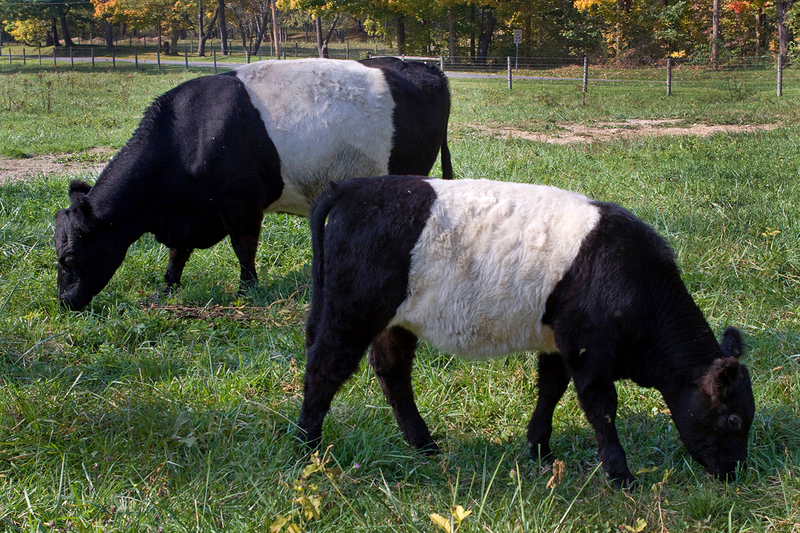 The herd of Belted Galloway cattle you can find grazing the rolling hillside pastures at Snake Hill Farm plays a key role in sustaining the entire operation. The natural foraging instinct of this heritage breed maximizes the opportunity to convert the lush green grass into beef for the table and manure for the fields and compost pile. Organically raised beef must meet strict federal standards, supported by extensive recordkeeping requirements and regular annual inspections. Our cattle stay out on pasture whenever weather permits. In winter they get hay grown organically on the Farm and neighboring fields. We also offer them limited amounts of grain (mostly spelt, oats and corn) for a more varied seasonal diet. They receive no hormones, antibiotics or other drugs except when essential to preserve life. They receive regular vaccinations recommended by the vet to ensure herd health. Our beef is sold both by individual cuts at North Union Farmers Markets and on the hoof direct from the farm. Click on Pricing for details about purchasing a whole, half or quarter animal. We also sell Belted Galloway cows, calves and bulls as breeding stock. We strive to maintain three select heritage bloodlines managed pursuant to the recommendations of The Livestock Conservancy.